James L. Barton et al, Black River & Buffalo, NY. 60hp engine, Robert McQueen Works, New York City. 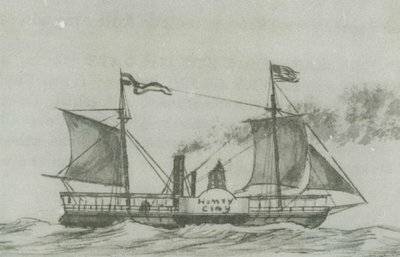 1825, Jun 9 Launched; 4th steamer enrolled Buffalo Creek District, NY; ran Buffalo - Detroit. 1826(1830? ), Aug 1 Broke shaft. 1827, Jun Trip to Green Bay, WI (3rd steamer to Lake Michigan) & Sault Ste. Marie, MI (1st steamer to Sault). 1830 Owned Walter Norton et al, Buffalo. 1830, Sep Grounded Green Bay. 1832 Chartered by government to carry troops to Black Hawk war in Illinois & Wisconsin; aborted at Detroit by cholera outbreak. 1835, Nov 11 Driven ashore.